Tysons Corner Center, Tysons Tower, Vita, and the Hyatt Regency are all located less than a half mile from the Tysons Corner Metro Station located on Washington Metropolitan Area Transit Authority’s (WMATA) Silver Line Metrorail. The Silver Line runs from Wiehle-Reston Station and travels east through Tysons to connect with the Orange Line just west of East Falls Church. 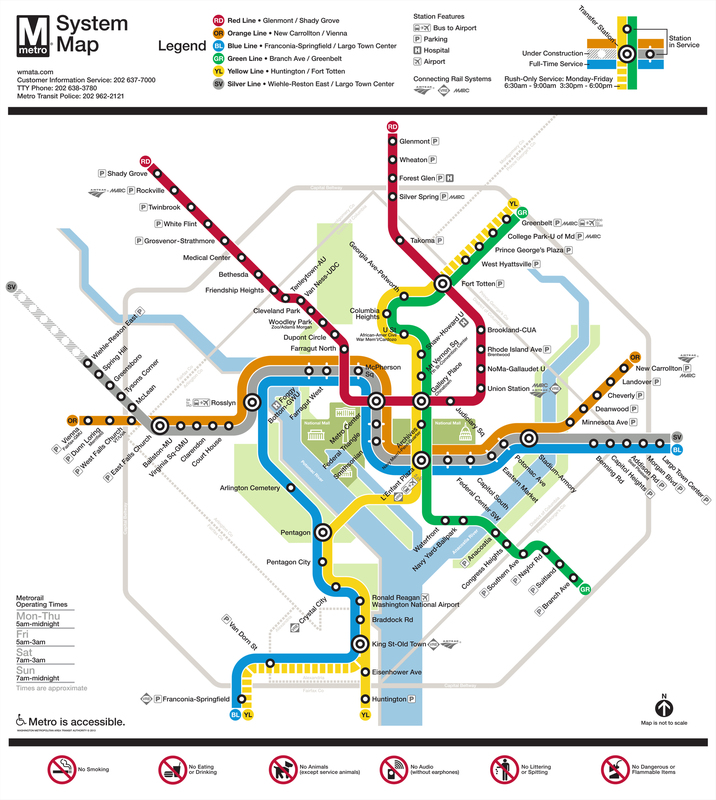 It then travels all the way through downtown D.C. to Largo Town Center, Serving all stations along the way just like the Orange and Blue Lines. 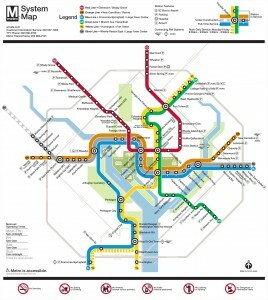 The Silver Line will run every 6 minutes during rush hour and every 12-15 minutes during off-peak times and weekends. It will be open Monday – Thursday, 5:00am – midnight. Friday, 5:00am to 3:00am. Saturday, 7:00am to 3:00am, and Sunday, 7:00am to midnight. Calculate how much your fare ride will be here! 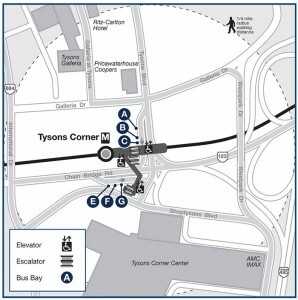 The Tysons Corner Station is located on Route 123 on the same side as Tysons Galleria and provides direct access via pedestrian bridge to Tysons Corner Center, Tysons Tower, Vita, and the Hyatt Regency. 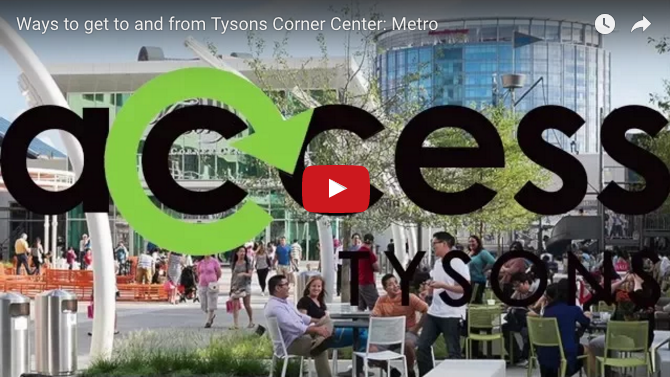 Wondering how to get from Tysons Corner Station to the mall? 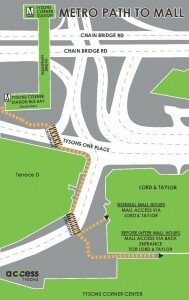 Check out Access Tysons’ Walking Map! There are 38 bike racks and 20 rental bikes available. There are also 6 bus bays providing bus service located on the North and South side of the station. 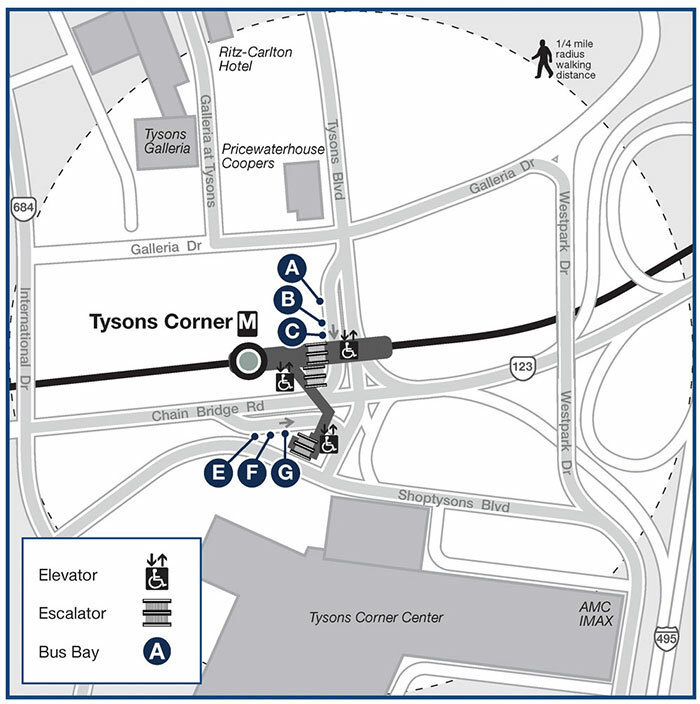 See which bus routes will be servicing Tysons Corner Station below.